Northern California’s Klamath River Valley is located in Siskiyou County and offers Clean Air, Clean Water, Minimum Crime, Wildlife and Nature’s Beauty! Step back in time into this uncrowded Paradise, with all the conveniences of the ’90s. The Shasta and Karuk Tribal people still inhabit this land and play a major role in the social, cultural, and economic structure of this wonderful countryside which spans the eastern high desert to the western dense mountainous forest. Osprey, bald eagle, and great blue heron have numerous nesting sites which are often easily viewable. Popular past-times include river rafting, backpacking, llamas, mule packing, horseback riding through the Marble Mountain Wilderness! Historic Towns along the Klamath River Include Happy Camp, Klamath River, Horse Creek, Scott Bar, Hamburg, Seiad Valley, Somes Bar, and Orleans. 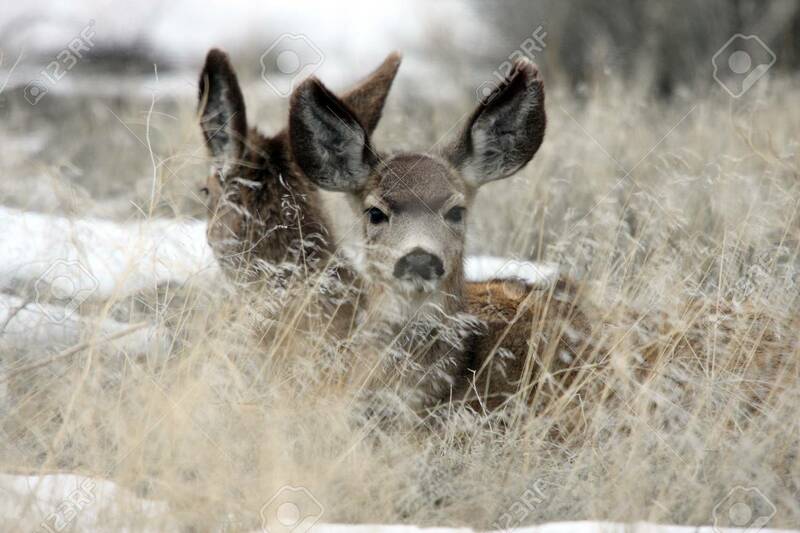 The largest deer herd in California, the Largest concentration of Ducks & Geese on the North American Continent, Black Bear, Bobcat, Mountain Lion, Raccoon, Quail, Grouse and Pheasant, Squirrel and over 200 species of Birds! Outdoor Activities: Quality Fly Fishing, Hunting, Water and Snow Skiing, Rafting, Tubing, Boating, Kayaking, Gold Mining, Golfing, Mountain Climbing, Snowmobiling, Biking, Camping, Hiking, Photography, Easy Access to the Pacific Crest Trail for Hikers as well as the Marble Mountain Wilderness which features miles of streams and over 85 pristine mountain lakes! Year-round boating and whitewater rafting opportunities with class I through IV International Whitewater Rating Scale rapids. Jet and Drift boat excursions are also available. The Klamath is famous for the fall and spring run of Salmon and Steelhead with a number of creeks and streams to fish. The area also offers some of the finest areas for hunting blacktail deer, black bear, dove, quail, grouse, and pigeon. 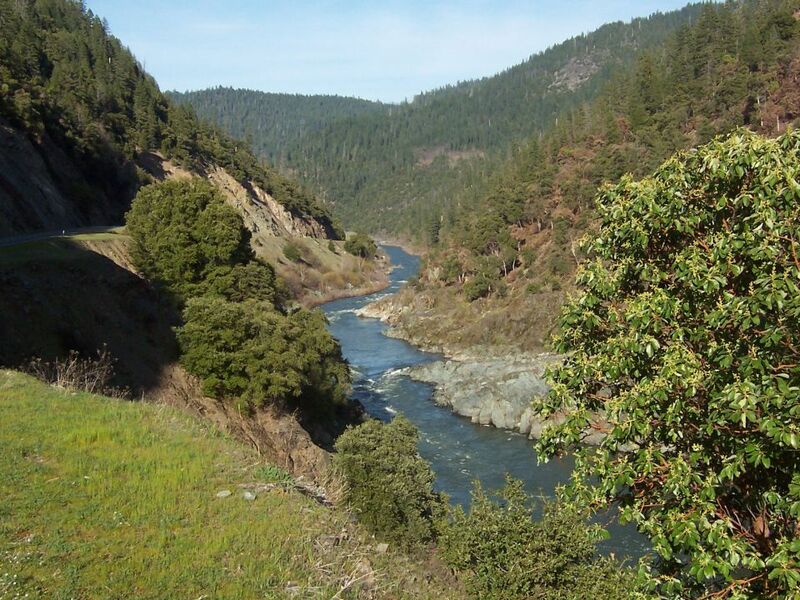 Travel the Wild and Scenic Klamath River Highway which is a maze of mountain roads. Happy Camp is also known for its recreational gold mining and other family outings. Instruction in gold panning and dredging is available by calling the Chamber of Commerce. This area is geographically known for its deposits of jade with gold inclusions and rhodonite. The Pacific Crest Trail runs through 120 miles of this area of the Klamath National Forest. Happy Camp is surrounded by 3 wilderness areas. 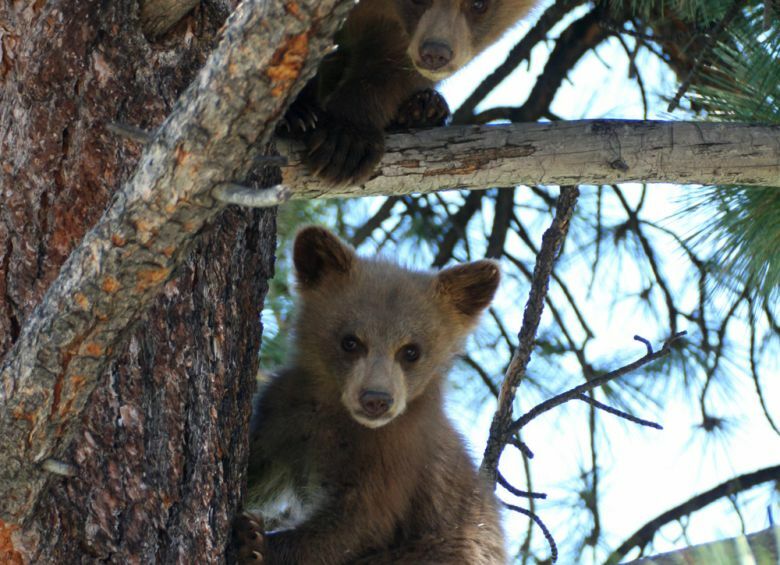 Many private, Forest Service and wilderness campgrounds are available. The Marble Mountain Wilderness alone boasts 89 pristine wilderness lakes accessible only on foot or by horseback. In this area, we have over 100 species of mammals and is a birdwatcher’s paradise of over 280 different species of birds. The diversity of wildlife here is truly an enthusiast’s dream. Summer temperatures range from 75F to 105F. Winter temperatures range from 15F to 60F. Temperatures below 15F are very rare. Rainfall averages from 20-55 inches. Snowfall in the valley is light and of short duration. The Shasta Indian Tribe occupied a vast area encompassing the upper reaches of the Salmon, Klamath, Scott, Shasta, and McCloud Rivers. During the winter, women, elders, and children occupied multiple-family houses while the hunters went into the surrounding mountains for venison. The Shastas also subsisted on dried fish, acorns and a bulb called apaw. Each spring new brush huts were made near the mouths of creeks entering the rivers, creating numerous small villages. The men fished for salmon and hunted deer with obsidian-tipped arrows. The women and children dived for mussels and gathered berries during the summer. The tribe had a 4000-pound sacred boulder called the Rain Rock located at Gottville. It was deeply pocked by the hands of medicine men over the past centuries, who buried the rock over 200 years ago to stop the rain and flooding. The rock now resides at a small museum in Fort Jones. In the late 1800s, Siskiyou Quicksilver Mining Co. extracted mercury from the cinnabar located up Beaver Creek. Tunnels were dug following gold veins and later used as storerooms for bootleg whiskey. In the 1890s, Job Garretson patented the same ground and built a two-story hotel and resort offering heated medicinal baths and attracting the wealthy to the area. 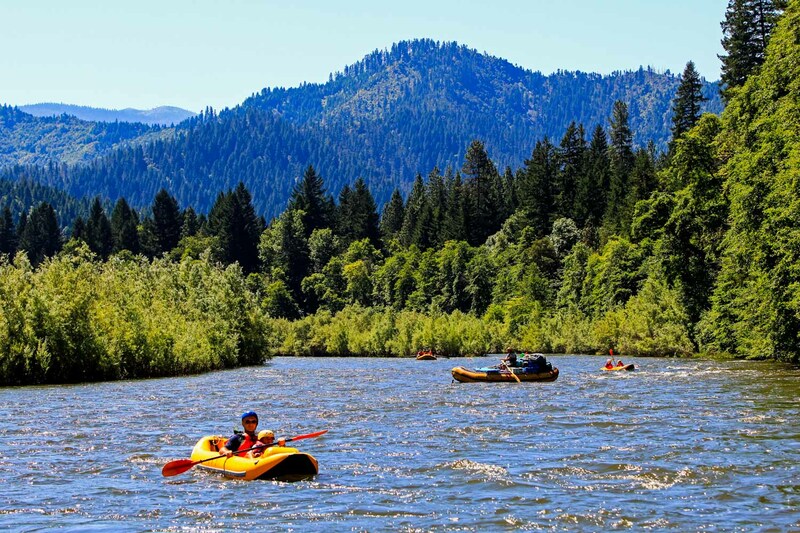 Happy Camp is located in the heart of the Karuk Tribe’s Ancestral Territory, which extends along the Klamath River from Bluff Creek through Siskiyou County and into southern Oregon. Since time immemorial the Karuk, whose name means “upriver people,” have resided in small villages along the Klamath River, where they continue such cultural traditions as hunting, gathering, fishing, basket making, and ceremonial dances. The Brush Dance, Jump Dance, and Pikyavish ceremonies last for several days and are practiced to heal and “fix the world,” to pray for plentiful acorns, deer, and salmon, and to restore social goodwill as well as individual good luck. The Karuk Tribe has effectively earned the status of a “self-governance Tribe.” The town of Happy Camp was named for the easy and rich gold pickings in the area. Its colorful history revolves around gold, copper, chrome, and jade mining with numerous large and small saw-mills, salmon and steelhead fishing, whitewater rafting, wild game hunting, and organic cultivation of exotic crops and animals. This tiny rural community is surrounded by the Klamath National Forest as well as the Marble Mountain, Siskiyou and Red Butte Wilderness areas. 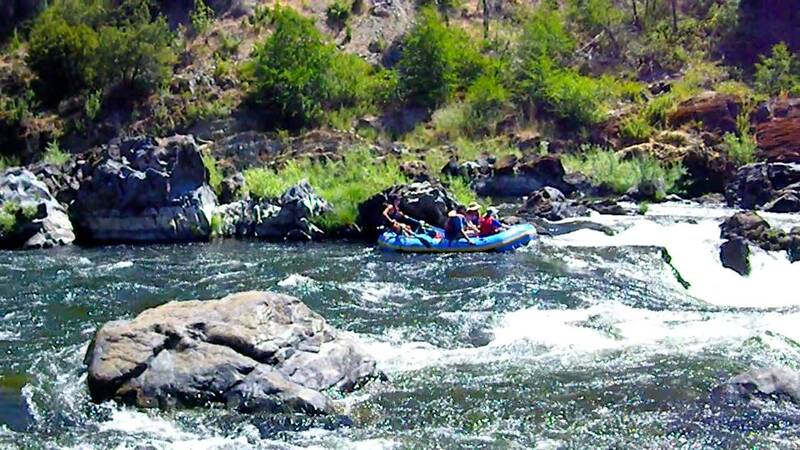 Experience this lovely, colorful blend of narrow valleys, steep forested mountains, rocky cliffs and the rugged Klamath River as it snakes it’s whitewater alongside the tiny, unincorporated, old mining town of Happy Camp, deep in the mysterious Klamath National Forest. 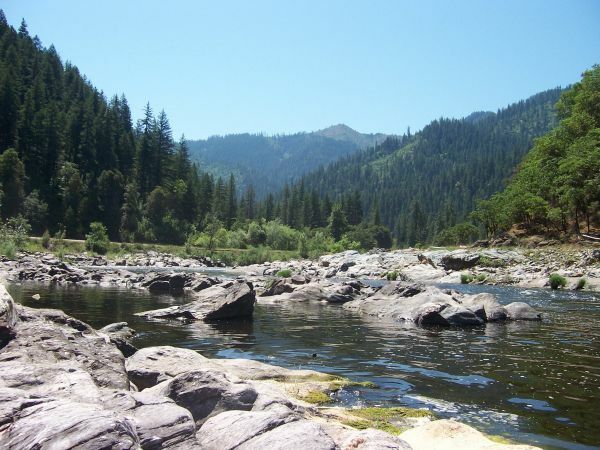 Remote, beautiful and rich in natural resources, Happy Camp can be found on Highway 96 midway between I-5 and the Pacific Coast and located in the center of the ancestral territory of the Karuk Tribe. For more information, visit the Happy Camp Chamber of Commerce.